It’s been several weeks since my last communication – a near eternity in the online realm, at least when measured against the thrice daily messages I seem to get from so many quarters – and I feel remiss in my role as Dean of The Pie Academy. My apologies. I hope you won’t take it personally. I’ve missed you, too, and perhaps it would help if I explained where I’ve been, and what activity has so preoccupied my time that I haven’t so much as sent a simple howdy-do since the holidays. 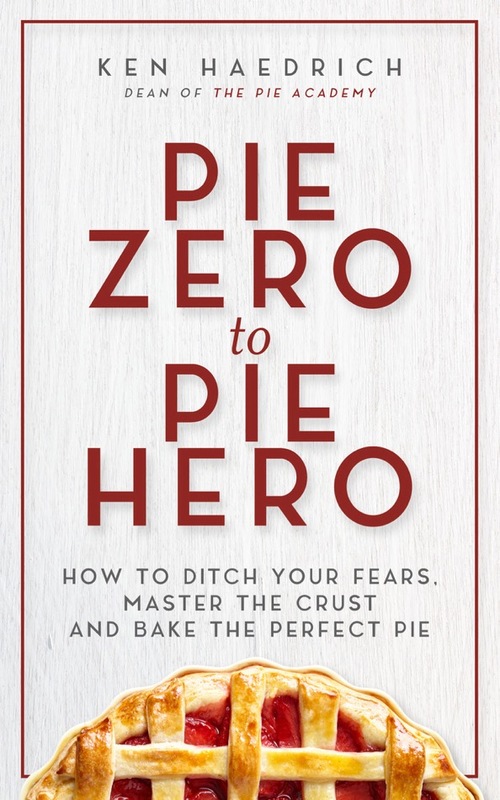 As I’ve mentioned here on more than one occasion, one of my current book projects is a collection of savory pie recipes that we – my publisher and I – are calling Dinner Pies. 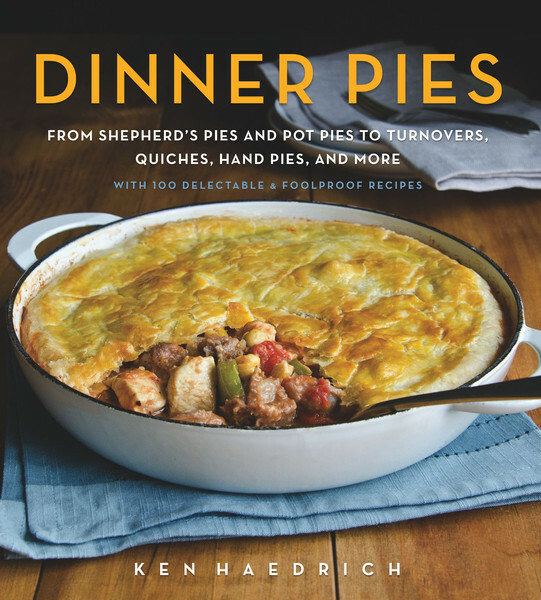 It’s a good title, a great collection of recipes, and one that encompasses everything from quiche to meat pies, pot pies, individual tarts, free form galettes, hand pies, mini pies and more. 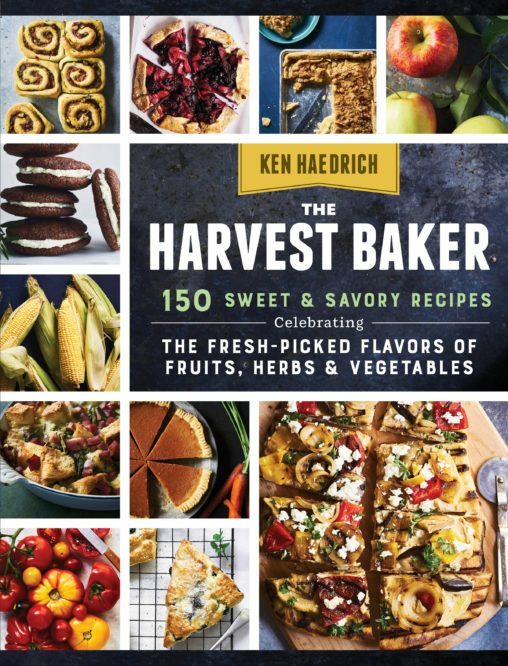 Anyway, I began working on the book last summer and only recently turned in the final recipes, much to my publisher’s delight. Publishers are, on the whole, fine and understanding folk, but their good nature tends to dissipate rather quickly when you promise them something – like a book manuscript – and fail to deliver. Mucks up their whole production schedule, and makes them feel like the bride who got stood up at the altar. So, while this task at hand has put a temporary damper on my Dean-like activities, the upside is that starting today – and leading up to the book’s release this fall – you’ll be treated to a veritable gravy train of recipes I plan to preview first here at The Pie Academy, like this week’s Philly Cheesesteak Hand Pies. I trust you’ve already figured this out on your own, but a Philly Cheesecake Hand Pie is essentially a Philly cheesesteak in a pastry – putting stuff in pastry the thing we do best here at The Pie Academy. I’m not aware of any precedent for this, but this hearty hand pie strikes me as the perfect game time grub when New England and Seattle duke it out on Sunday evening. Our pastry for this game day baking project is our empanada dough, which I like for many of my hand pies. Especially when eaten fresh from the oven, this dough has all the flakiness of richer pastries, but it’s more durable, less likely to fall apart when you’re handling it. Indeed, that’s the reason why – in the new book – I call this dough Flaky and Sturdy Hand Pie Pastry. Do try to serve these warm, about 10 to 15 minutes out of the oven. 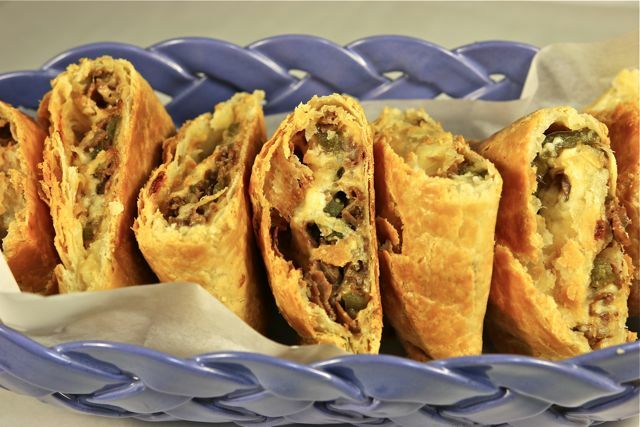 That’s the best way to experience the sweet, sauteed onions and green pepper, the juicy beef, and gooey cheese filling. Make them earlier in the day, cover and refrigerate, then pop them into the oven about an hour before you plan to serve them. 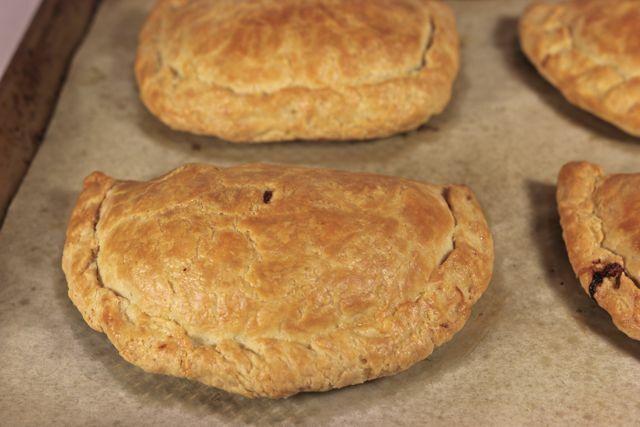 These are oversized hand pies – not quite the size of a deflated football (sorry, I couldn’t resist) but large enough that you’ll want to halve them before propping them up in a lined basket for serving, like you see here above. They’re excellent on their own, but you can also serve them with a dipping sauce. What I do is make a separate batch of the mayonnaise sauce that goes IN the hand pies, spike it with some prepared mustard and additional Tabasco, and serve that on the side. Makes a fine dipper. I think you’ll really enjoy these. Let me know. 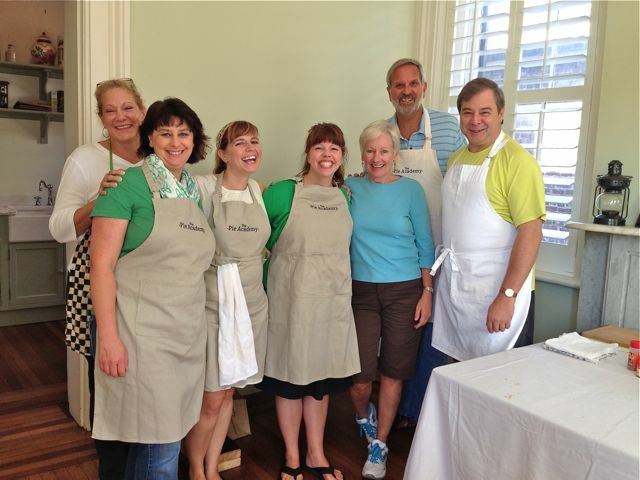 Many of you have asked for details about this year’s Lowcountry Pie Getaway, so here’s what we know right now. At this point, Charleston, South Carolina is the primary town under consideration. We are actively looking at different locations for hosting the event, and trying to put together a program – like last year’s, in Savannah – that will offer plenty of time for both hands on pie making, and enough free time to explore all the area has to offer. And while you would need several weeks to do that, we’ll try to fit as much as we can into a long weekend in October, fall being one of the nicest times of year to visit Charleston. One of our challenges is to find a venue – or the right combination of venues – to accommodate what promises to be, by early indications, a much larger turnout. As soon as we know more, you’ll be the first to hear. Meanwhile, you don’t have to wait until October to hone your pie making skills. You can get an early start by joining the nearly one hundred Pie Academy members who’ve been baking their way toward pie mastery with our video training course – The No-More-Tears Pie Pastry Course. 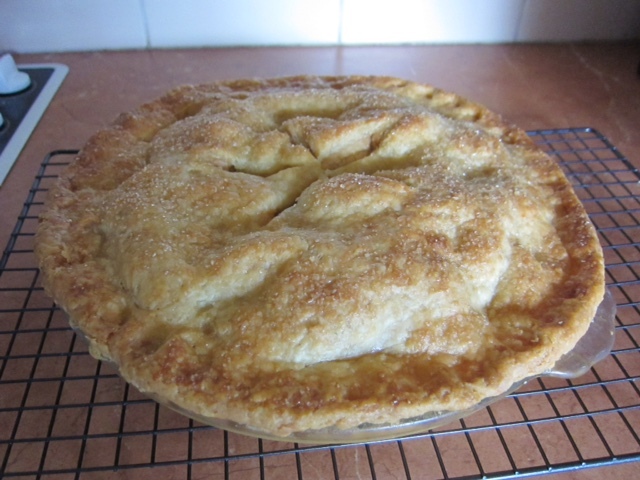 Here are 2 photos of my apple pie. I am so proud of my finished product. And guess what, Ken? I am excited about making pastry in the food processor again because by following your instructions it rolled out so beautifully. I now have a list of friends and relatives asking me to make an apple pie for them. Like I told Lynne, that list will only get longer as time goes by! 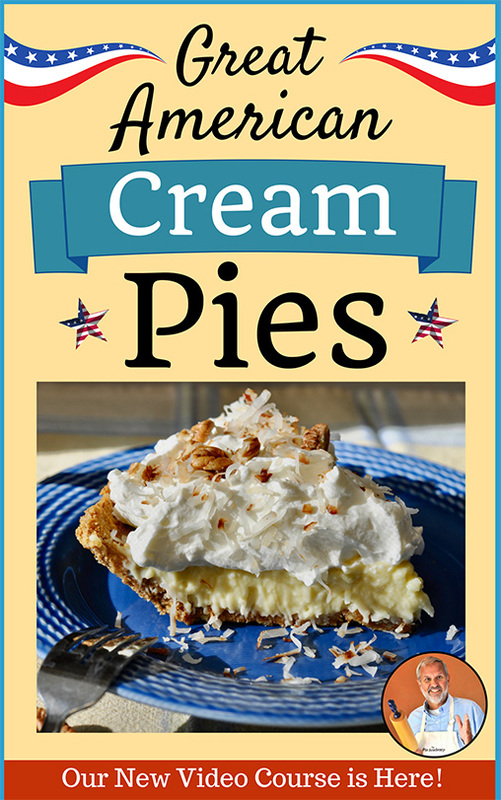 If you want to learn more about The No-More-Tears Pie Pastry Course – which includes detailed instruction and videos for both the food processor and hand method for making dough – just click here. RECIPE NOTES – To find the Empanada Dough recipe, click here and scroll down to the bottom of the post. 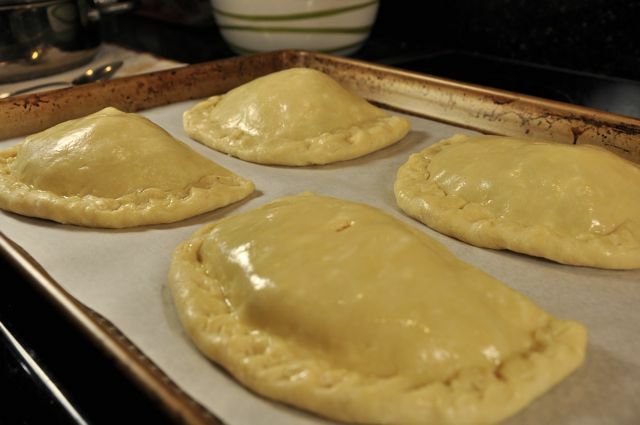 If you haven't already, prepare the empanada dough and divide it into 4 equal pieces. Flatten each one into a disk about 1/2-inch thick. Wrap separately in plastic wrap and refrigerate for at least 1 to 1 1/2 hours. At least 30 minutes before you plan to assemble these, melt the butter in a large skillet. Stir in the onion and green pepper. Saute over moderate heat for 10 to 12 minutes, until the onion is beginning to turn golden. Add salt and pepper to taste. When the vegetables are done, cut the roast beef into approximate 1-inch strips and add to the skillet. Cook, stirring, for 3 to 4 minutes, until the beef has browned. Add a good bit of Worcestershire sauce, to taste. Remove from the heat and transfer the mixture to a plate, to cool. Working with one piece of dough at a time, roll it into an oblong about 8 inches wide and 10 inches long. Draw an imaginary line across the center, then sprinkle 1/4 cup grated cheese just to one side of that line, leaving a border of 1-inch around the edge. Pile one-quarter of the meat mixture on top of the cheese, then dollop with 1 1/2 to 2 tablespoons of the mayonnaise mixture. Top with another 1/4 cup of cheese. Press down gently, to compact the filling. 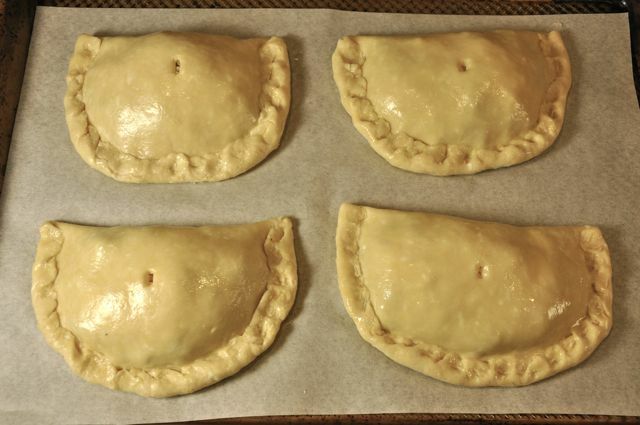 Brush each of the hand pies sparingly with the egg wash. Bake on the center oven rack for 35 to 40 minutes, until golden brown. Turn the sheet 180° midway through the baking, so they brown evenly. Transfer to a rack and cool for 10 to 15 minutes before serving. MAKES 4 LARGE HAND PIES.